This is a really big lens with a detailed intricate swirly print that is reminiscent of the Victorian period. 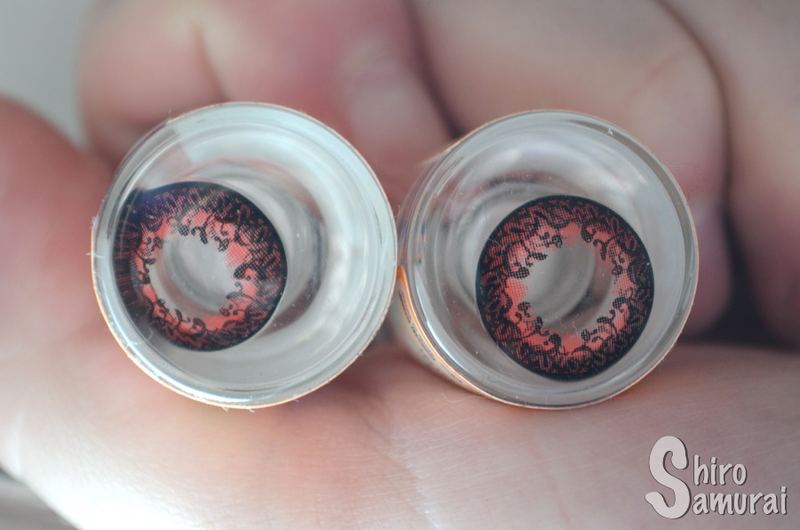 It's one of my favorite circle lens designs and it goes really well for any darker fashion styles – think goths, Visual Kei etc. ^^ The lens itself is a bit darker in tone and the red color, although an unnatural color in itself, isn't actually overwhelming; I think the black swirls soften the impact of the red. 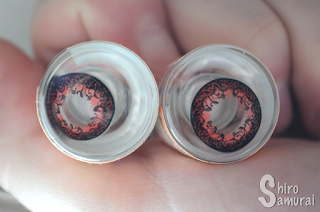 The I.Fairy Venus series have a really noticeable thick limbal ring and even though it's not a solid black it still gives a big impact – in the case of these red lenses the limbal ring is a darker red, mixed with black details. One lens in. Notice the enlargement. These cover my real eye color well enough and blends surprisingly naturally at the center, meaning that my light blue-gray eyes don't clash horribly with the red. The red shade is pleasant and actually doesn't appear as freaky or unnatural as one might expect from a red lens. 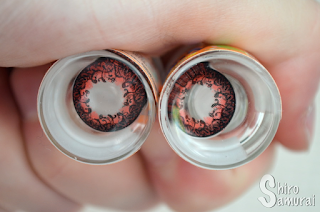 Of course it's still not natural-looking enough to pass as a daily lens but it's definitely a fun pair for alternative fashion fans and those who like to stand out. The comfort is below average. 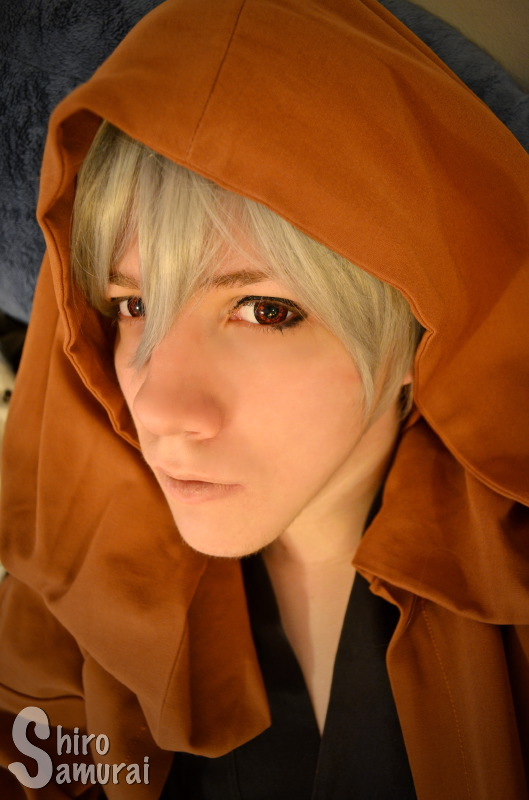 I had some trouble with the right lens because it kept feeling scratchy even after reinserting it a couple times. These lenses made my eyes tear up and I kept crying for at around 10 minutes before my eyes got used to these lenses – not so good. :| My eyes were really watery. I can wear them for around 3 hours before I start to feel the first signs of dryness. My estimate is that I could wear these anywhere around 2-4 hours, possibly 5 hours if I used eyedrops. All photos taken by me during a December afternoon with a semi-clear sky and a setting sun very low in the horizon. We have polar night right now and it means that the sun rises really late and goes down early, hence the orange light. There's no color filters or such on the close-up photos and that's so that the colors would be as true to real life as possible. Apartment room light. Lamps on. Outdoors, back against sun. Cloudy. Outdoors, back against setting sun. What can I say? 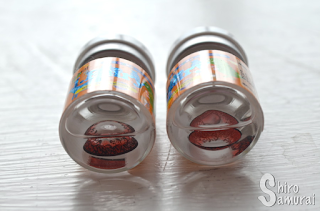 It's a gorgeous lens that's hindered by its below average comfort but, then again, I do have sensitive eyes and I opened these late (meaning a couple months before they would have expired in their vials) so my comfort grade might not be accurate. The I.Fairy Venus Red could work for cosplay but I mostly see it as an extra-ordinary fashion lens for those who want to make a statement. The design is unique and it's a fun lens to wear! The red shows up well and still something keeps it from being like those obnoxiously bright red crazy lenses, which could be a good thing if you want a more sophisticated red color. :) So yeah, it's an eye-catching lens that still, somehow, manages to not be too flashy, haha. Want to see the I.Fairy Venus series in other colors? A slightly darker and toned-down red shade. It's not really vivid enough to jump at you. Beautifully detailed Victorian-esque whirly print. Mystical and mesmerizing. Good coverage on light eyes. 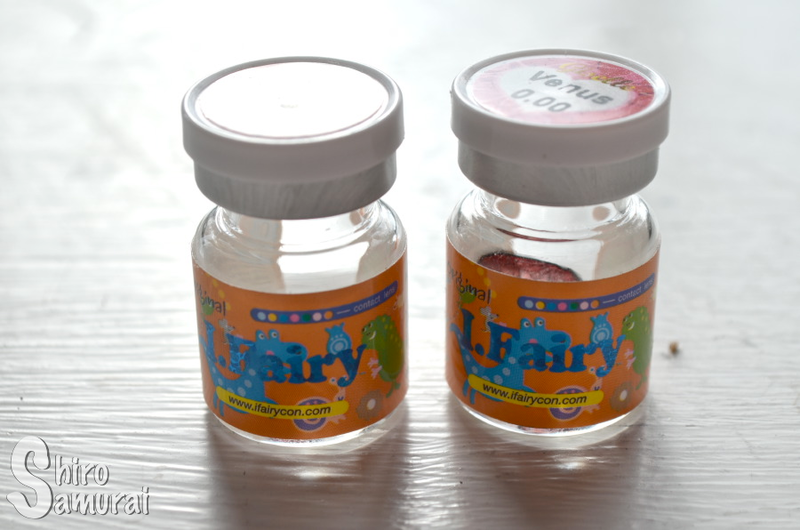 These make my eyes really watery after insertion (lasts approx. 10 min) and occasionally feel a bit scratchy. I can wear them for around 3 hours before they start to show the first signs of dryness.